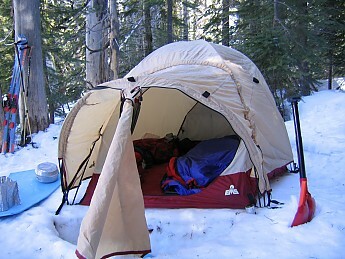 I haven't been winter camping for quite a while, so have decided to sell off some of my gear that has just been in storage for the past few years. I put some of it on eBay, but will sell it direct here as well. I have pictures of everything so email me for the pics. EMS Pompero tent - 2 person, double wall 5 pole convertible tent (mesh windows with flaps that zip over them). Two vestibules, one big one and one smaller one at the other end. Tan and Maroon in color This is a heavy, well designed winter shelter for 2 people. 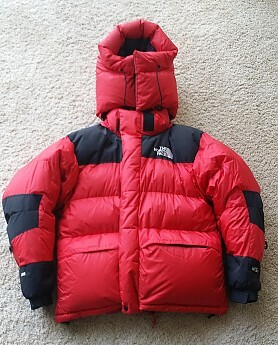 Older model, but in very good condition and comparable to a TNF in my opinion. 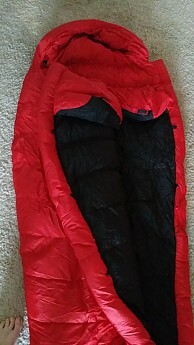 used it in Yosemite at Dewey Point a few times - $175. Marmot Alba winter bag - regular. Bought it used, but never used it. It looks new. The original owner barely used it either. Taffeta shell, goose down. Red and black. Temp rating -10F/-23C. I have a spec sheet Marmot sent me. Comes with stuff sack and cotton storage bag. Sold new in 1993 for $403, according to Marmot, which is about $690 in today's money. I had it professionally cleaned before putting it in storage - $300. 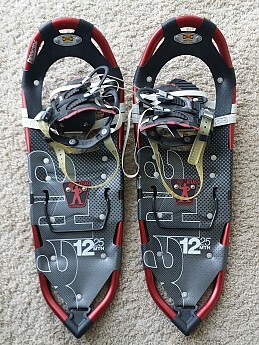 Atlas 1225 Mountain snowshoes - never used, perfect condition. These are high end backcountry snowshoes with very aggressive grip and heel lifts. Good for carrying a heavy pack or towing a sled - $125. We can discuss shipping. I will ship to Canada, too (or anywhere else for that matter). Any questions, let me know. I was an active member here for a long time, but haven't been around for quite a while. My old posts are still here if you want to check any of them out.